I Can't Believe I Wore This for 9 Days! 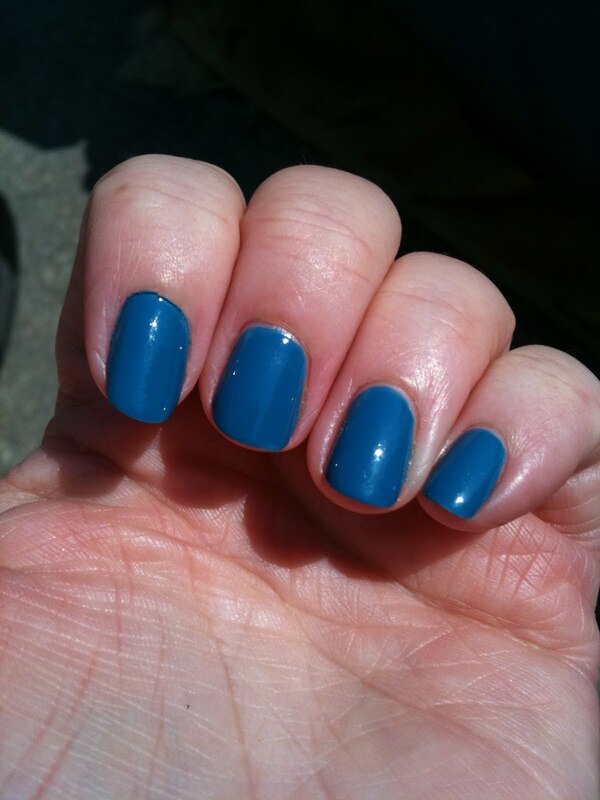 In some regards, its kinda disappointing to think my nails only grew by that little bit in 9 days-but it did hold up well, no chips, no topcoats, nothing other than minor tipwear. 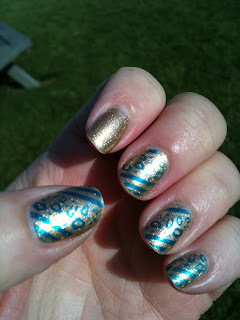 Who needs Shellac when this holds up like this-on real nails even-not even acrylics! I think this is pretty good! 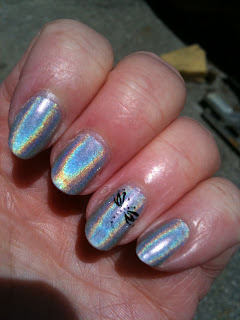 The holo stamp is kinda more visible-feel free to click to see enlarged image. 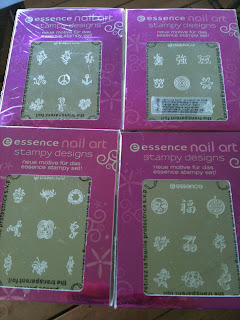 On a very happy note, a kind swapper sent me these amazing plates-Essence Stampy image plates. I was only expecting one so when four-yes, four! of them showed up in my mailbox, I was estatic. Thrilled beyond words actually and totally stunned by the kindness of a fellow polish addict that I have never met half way around the world! 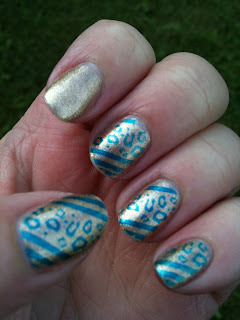 I've already changed my mani and am in the middle of stamping with the new plate so will post them soon! Three Days of Different Looks with Same Polishes! 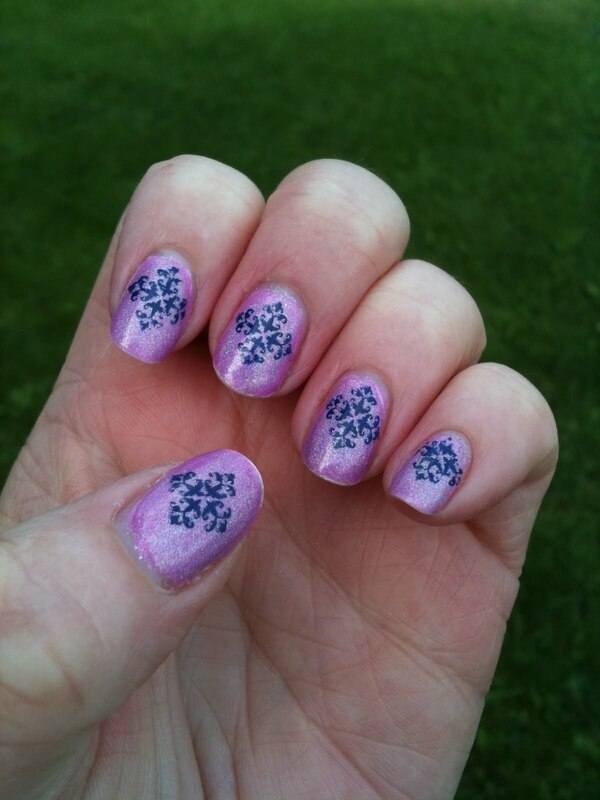 Meganchair of Little Music Boxes (see sidebar for her blog link as I am a follower of her great blog) posted her 'blackberry mani' a few days back so I thought I could create my version of my LG Rumour mani.... as I do not own a blackberry! This is OPI Suzi Says Feng Shui on the fingers and OPI Absolutely Alice on thumb. 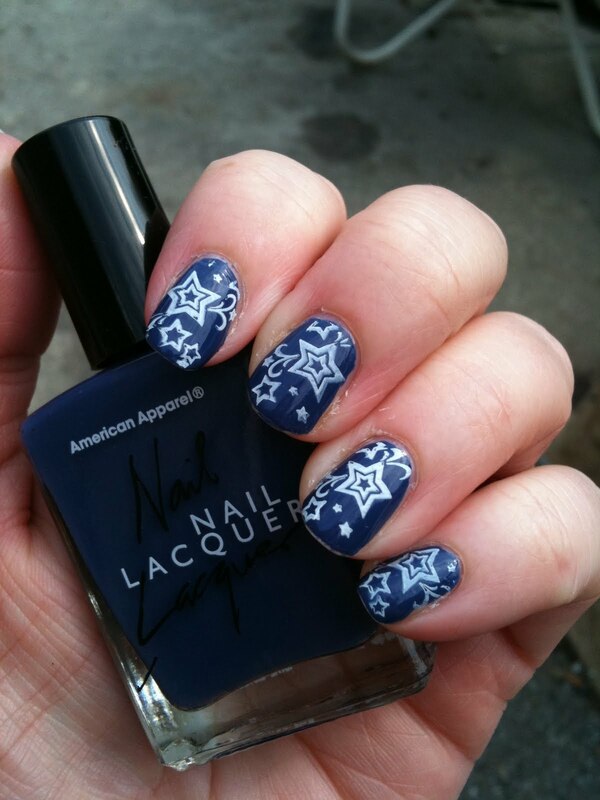 I got AA when it orginally came out as part of the 2010 Spring Alice in Wonderland collection but it was an untried until now. I don't know why I waited. I love this blingy blue! Even did my pedi in it! Day 2, did a funky french on the tips of SSFS using AA! 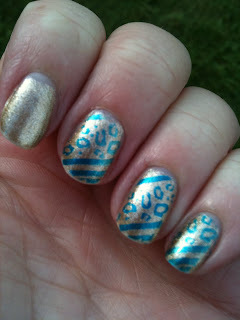 Day 3, decided to stamp using China Glaze OMG using Bundle Monster plate 20. Unfortunately under the grey skies here I wasn't able to take a picture of the holo of the image but I was able to capture the rainbow slightly. 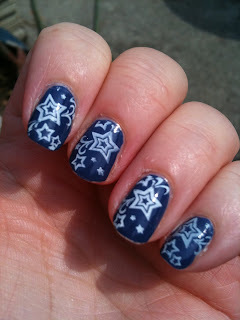 I still have this on as I want to see if the sun pokes out long enough to take a good picture of the stamp! 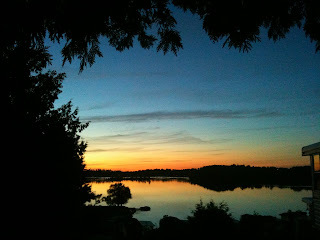 I know a lot of the fall collections are starting to be released but I'm still thinking summer. Lots of time to wear those dark colours when the colder weather starts to roll in...so I wanted a nice and bright polish to compliment the beau-t-ful weather we have been experiencing! 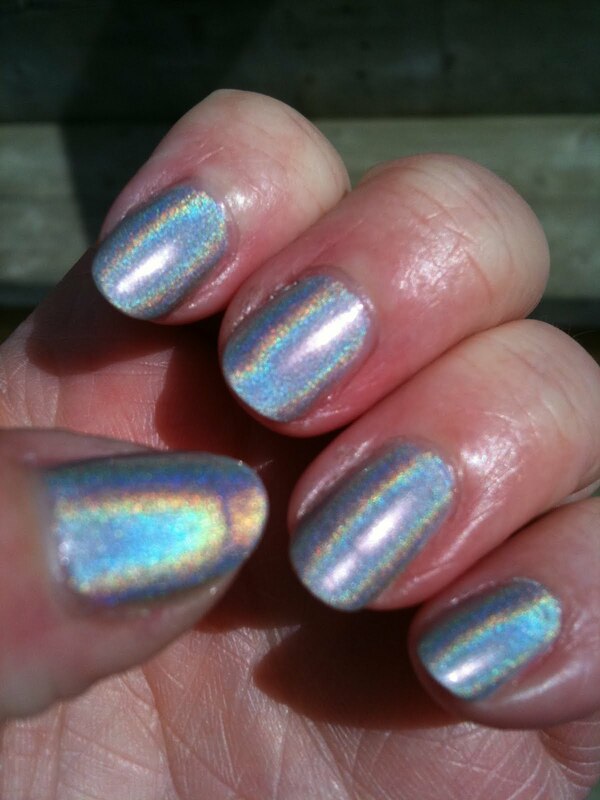 This is OPI the "it" Color. This isn't over the top neon yellow or nothing, not even eye popping yellow, just a nice bright fun colour for summer. 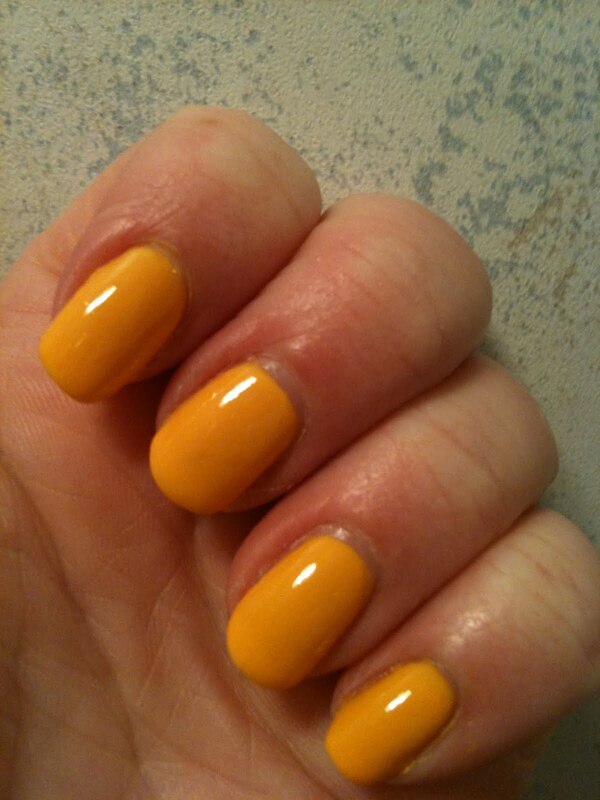 I have read lots about yellow being a difficult, streaky colour to apply but I didn't find that it all. 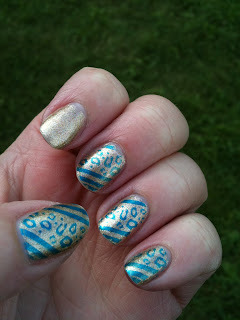 I could have gotten away with two coats but did three as I didn't want to have any obvious VNL in my mani especially when taking pix. 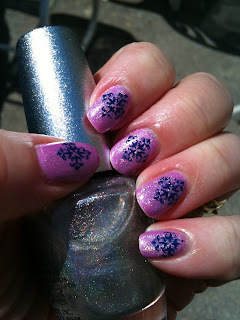 Keeping in the theme of fun, stamped with black Konad special polish using fauxnad image plates m51 and T28. Lotsa fun! 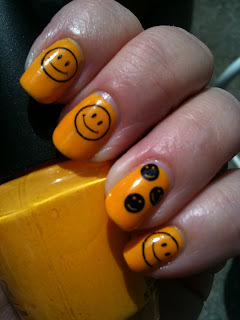 This mani brought some smiles from people as I was out and about shopping...for polishes, what else?.........doesn't it make your day when you get a nice compliment on your mani? 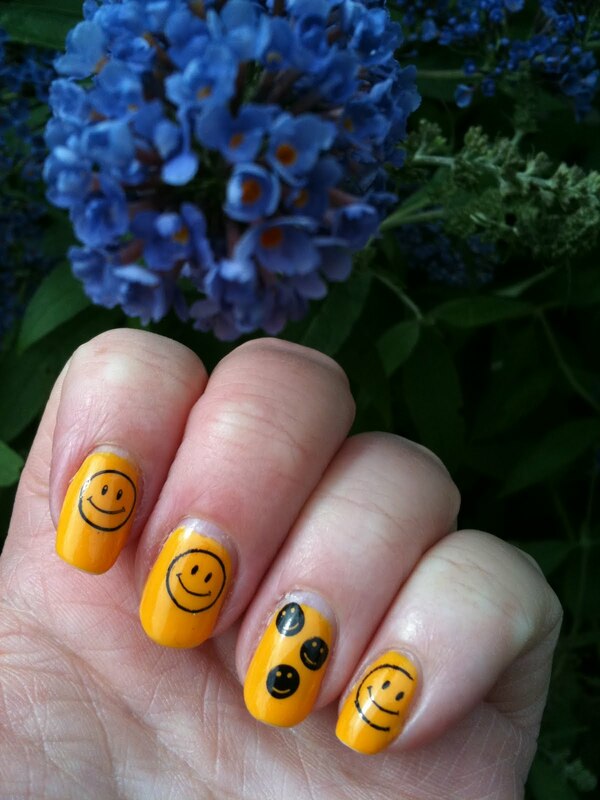 A lovely board member from The Netherlands and I recently exchanged some polishes and one of my lemmings was fulfilled...China Glaze Shaken Not Shirred. This shimmery polish is perfect for summer. I used a coat of white polish underneath as a base to hopefully make the colour pop-as I've never used the polish before, don't know if the results did it or not? After a couple of pictures, I topped with one thin coat of OPI ds Shimmer-holy smokeys-the sparkle is soooo cool! 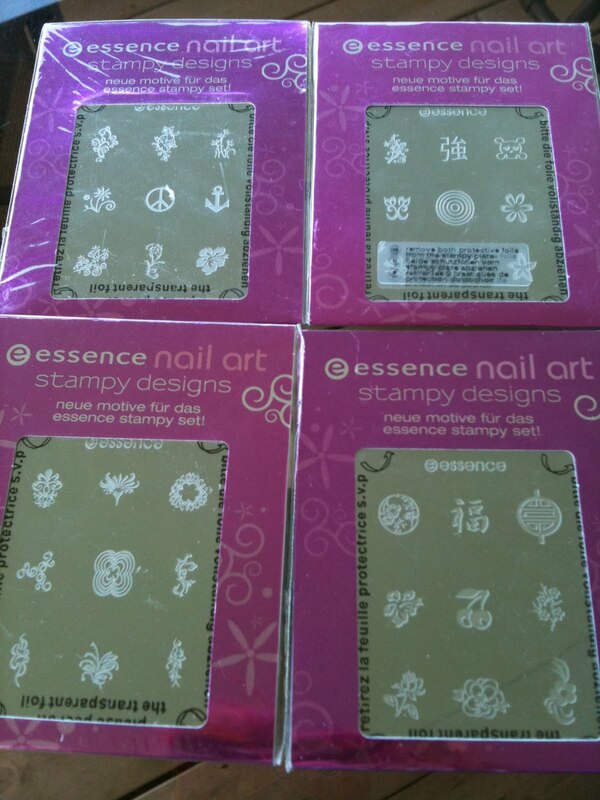 No manicure is complete until stamped-at least in my world! I didn't want to use a stamp that would cover the fantasticness (is that a word?) 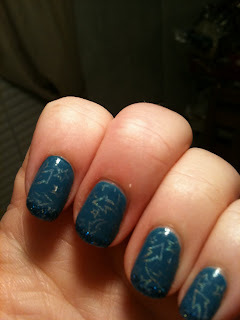 of this layering and sparkle, and was eyeing this stamp and design for a while but chicken to try it would as I would think it would not be forgiving if slightly not just so...and I was right. This is Amisy fauxnad D02. Now I've had plenty of nail fails with stamping and those who do it knows it takes a bit of practise to line up and place the stamp where you want up. 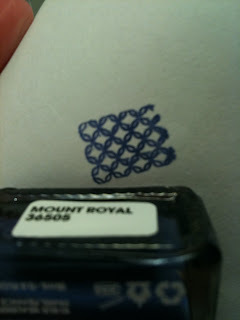 I nailed the first stamp -perfectly centered and straight in thumb...but ....it went downhill from there. Thank goodness you can use hand santizer immediately after swatching to remove stamp with no ill affect to the polish underneath! (A couple of nails I removed stamp a couple of times until it was just so and lined up decently. Priceless information for anyone not doing this already!) Stamped using Konad special polish in Royal Purple. 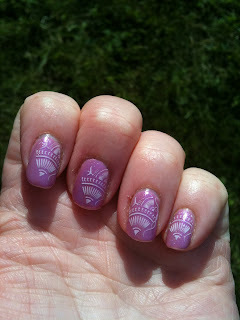 I was happy with the end result of the stamping with them lining up pretty good and centered on the nail. All in all, I was thrilled with how this sparkly mani turned out! 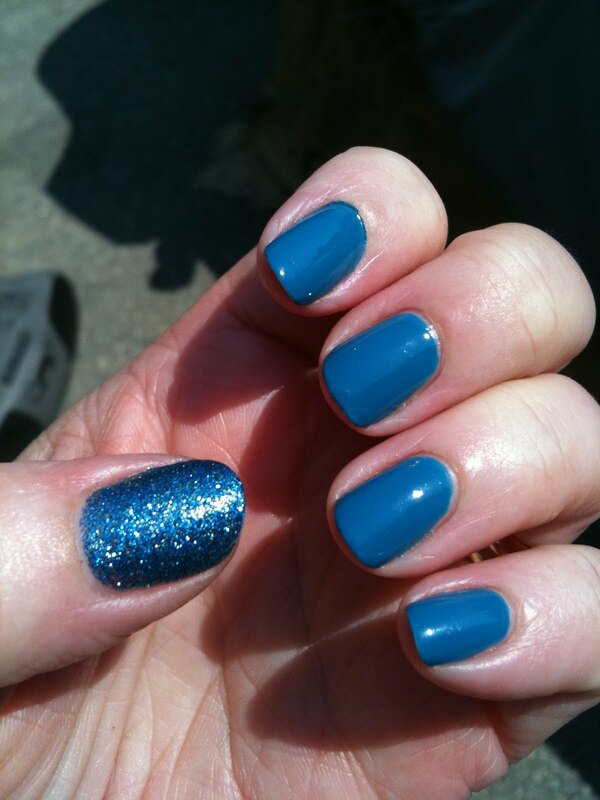 Loved using ds shimmer for sparkly topcat-which was the first time -and am sure there will be many more mani's using it! I stumbled across an AA store at the mall and thought I'd take a peak to see if by chance they had the polishes in and lucky for me, there was a full display. I was truly thrilled with the application of this polish-one coat was full coverage. This was Mount Royal and if the rest provide the same great coverage with one coat, I'll be very pleased with all my purchases. 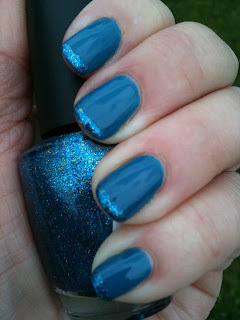 Mount Royal is a deep blue/purple cream which I loved! Wear was good too; you may be seeing some shrinkage from SV but no chipping even after 3 days. Removal was a dream-no staining of nails nor messy skin staining even for such a dark colour (unlike A&O-Morning After that stained my skin soooo badly......) By then, time to change your mani, right? Stamped using Konad white special polish with BundleMonster IP BM21. Any by the way, this polish would be suitable for stamping, for those who may want to know/try it out. For those of us who are stamping fanatics, we are always looking for a new polish that we can use when doing our stamping! 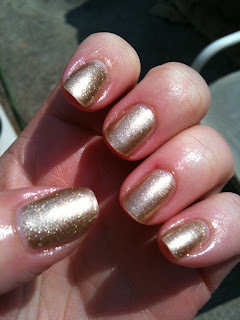 OPI Swiss Collection-Glitzerland Glittery Goodness! All images are clickable to enlarge! 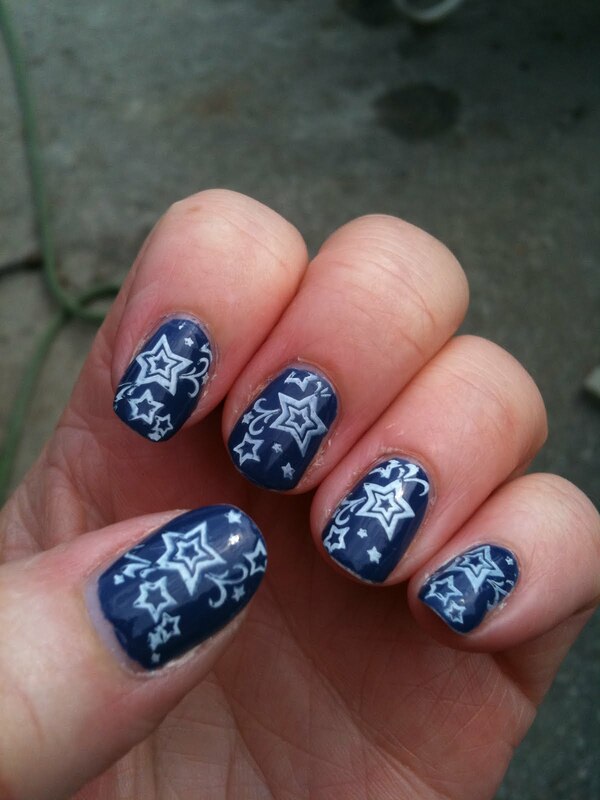 I was tired of stamping with the same old white and black Konad polishes so thought I'd give another colour a try. I decided to use Konad princess special polish in Pearl Blue but it kinda looked greenish when stamped. This is Konad IP m81. 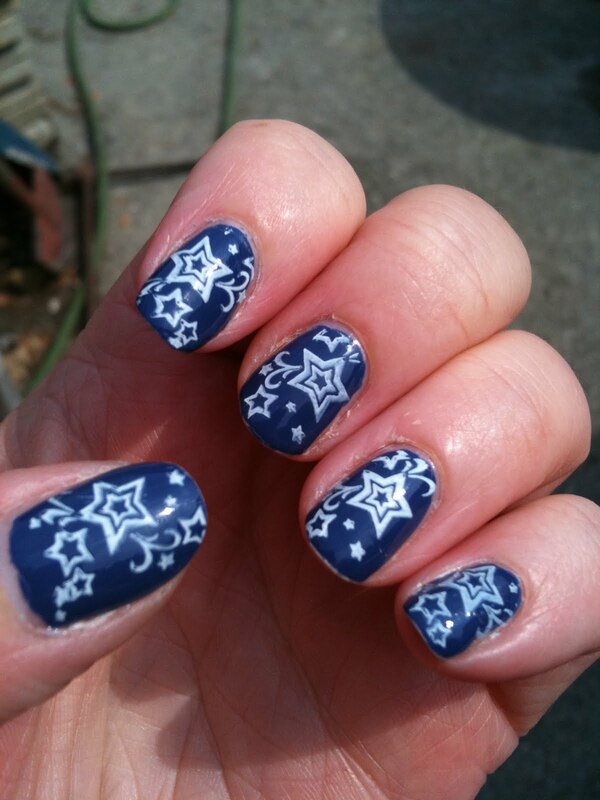 Next time I think I'll try a darker navy colour or maybe even royal purple. 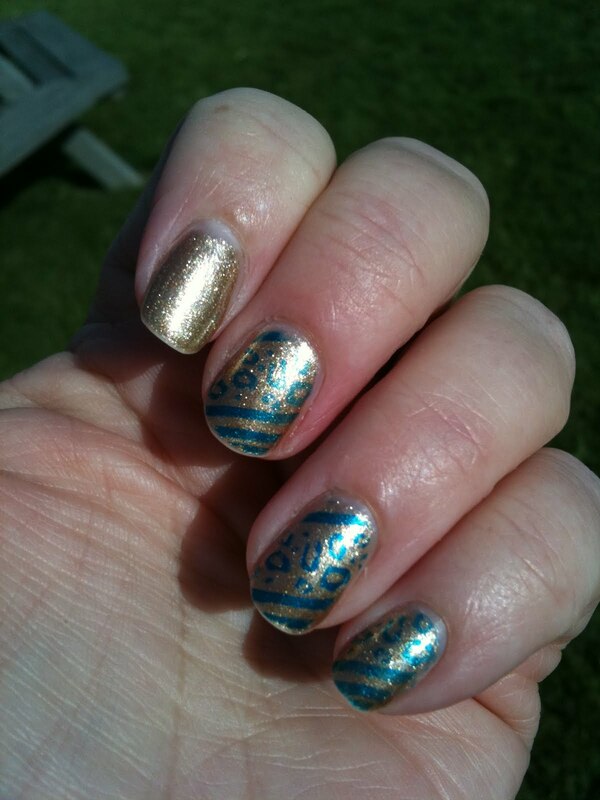 I wore this polish 5 days - no chips. 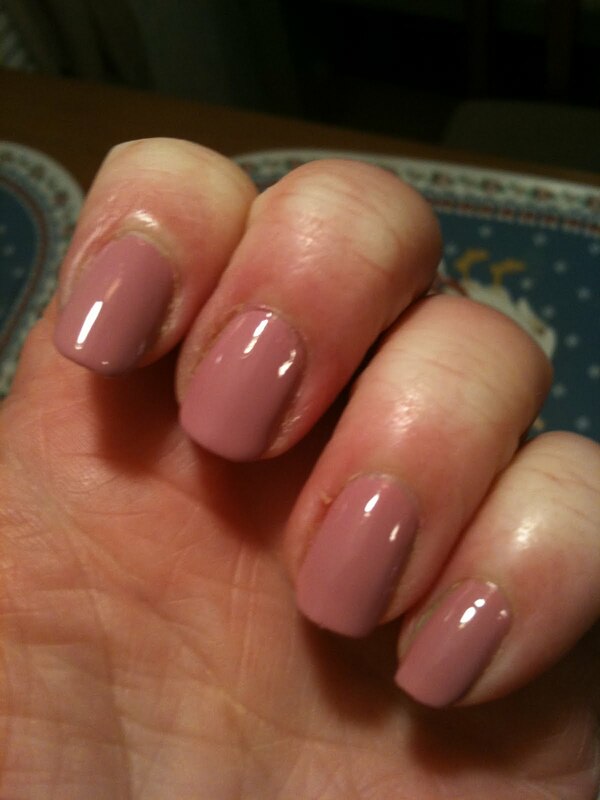 Only changed, well....to use another untried colour! 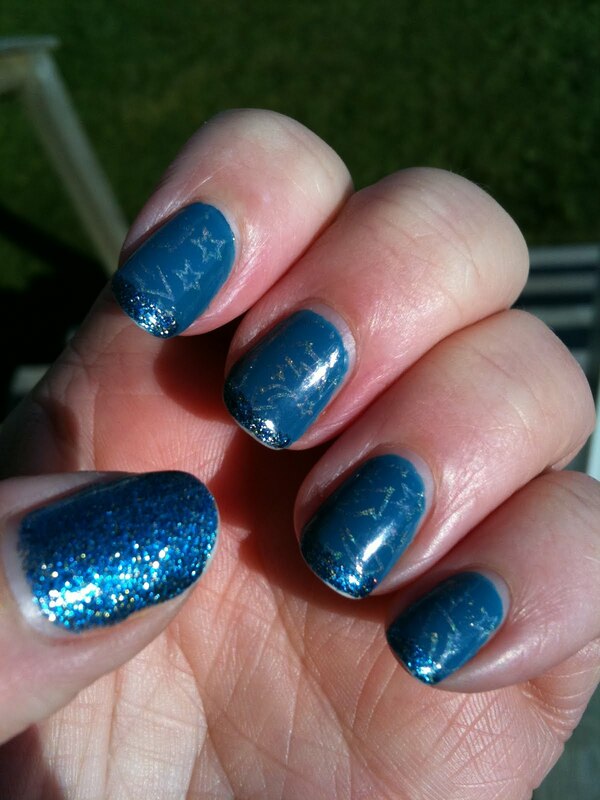 Edit: I should clarify that this polish is not a glitter polish and personally, I would not use it a glitter topcoat over a cream for example as it would be much too opaque, but moreso using the word glittery to indicate it is very sparkly and blingy. First and foremost, please accept my apologies for the sad, sad state of my cuticles. I was on vacation last week and just was not looking after them as much as I should have been! But they are slowly getting back on track. I even thought about not posting these but hey, my blog was started as a record of my stamping and this is record of the mani I did at the time. Plus we all have good days and bad, right? 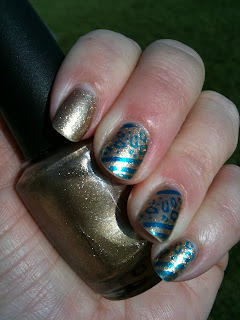 This was a quick mani of a couple polishes I found on sale at Sally's for $2.79 each! 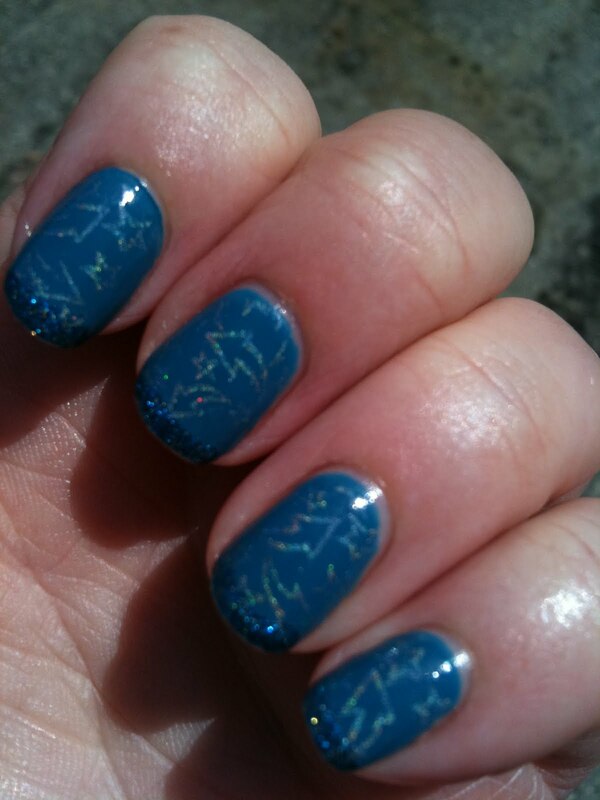 First was two coats of Nina Ultra Pro in Sweet Nothings. Then layered with a coat of Savvy Purple Potion. 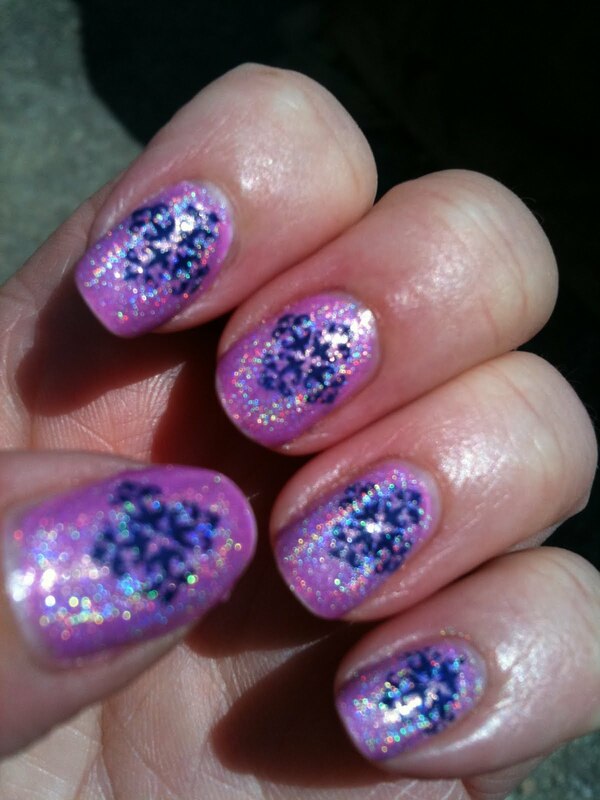 This collection of very sheer and sparkly polishes are great to use for layering and add an extra something to the mani. The last pix was a quick indoor picture so not that colour accurate but wanted to take a quick one before layering the Savvy polish over it. 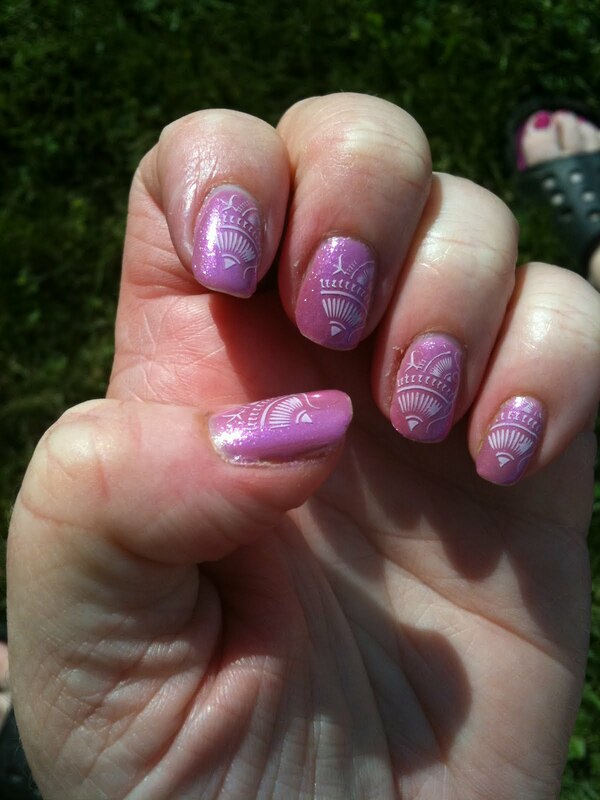 Stamped with fauxnad IP A19 using Konad white special polish. 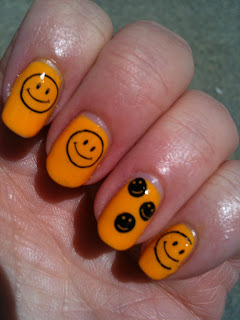 The stamp barely fit my little tiny nails especially my pinkie! I so envy those bloggers who have larger and longer nails. But on the bright side, a lot of the full nail image plates that they say don't find on their nails generally fit mine so I guess there is some benefit in having teeny nails! I came to the nail game after the OMG collection came out but little by little I have tracked them down bottle by glorious bottle, except for the elusive OMG. 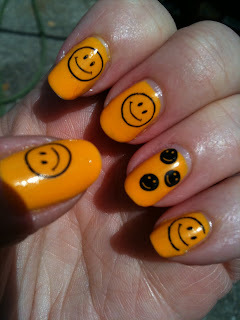 Imagine my surprise about three months ago that I stumbled across this little nail supply that had OMG in stock! It was the only colour of the collection that was in stock and I can easily see why - unless you know what this glorious rainbow in a bottle does, it would be easy to pass up on the shelf. Of course I had to stamp this but I didn't want to cover the rainbow gloriness so stamped an accent nail with black Konad special polish, fauxnad IP H2. 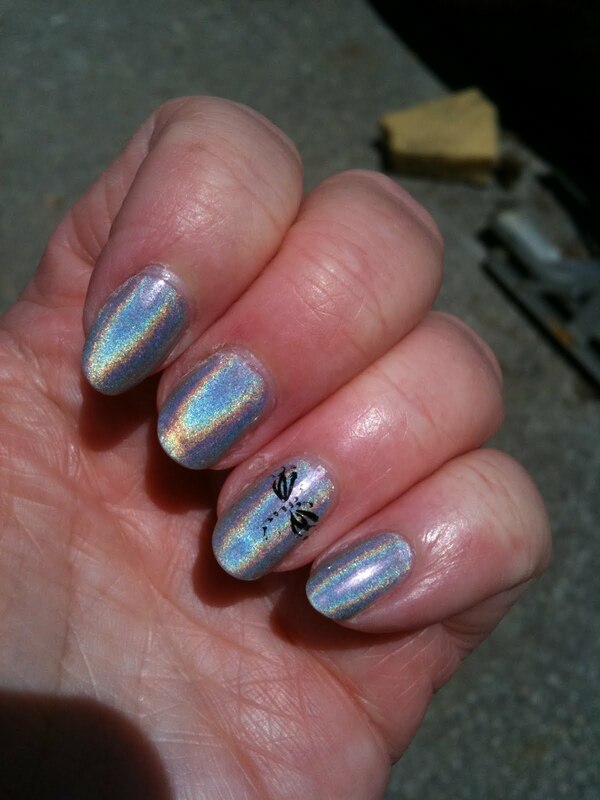 Looking back, I didn't think the dainty dragonfly did the polish justice and should have been a edgier design or pattern, but another mani, another day!